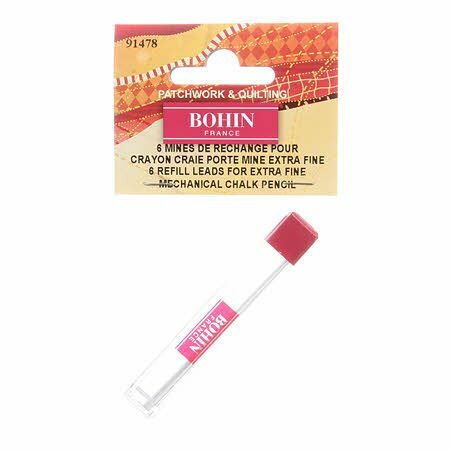 This package contains 6 refill leads for use in the Bohin Extra Fine Mechanical Pencil (sold separately). Water soluble, can be washed out or erased with any fabric eraser. Ever wonder how to mark effectively on dark fabrics? 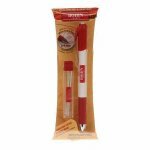 White mechanical pencil is the fast and accurate way to transfer your markings onto your quilt with ease. This water soluble pencil can be washed out or erased with any fabric eraser. Extra fine lead for marking on fabrics. Recommended for patchwork, quilting, garment making, clothing, and sewing. Comes equipped with twist eraser that is long lasting. Colored leads are made of ceramic that are strong with colorants that cannot penetrate into the fabric.